Ann Budd is an excellent teacher who helps others develop their own approach to knitting and designing. With Ann's extensive back ground as a knitting editor she knows many different designer's methods for garment construction as well as pattern stitches and knitting techniques. Ann brings together designs by many designers and likes to integrate all of the parts of any garment so each part flows organically into the next so all the parts fit together harmoniously. Ann Budd was eleven years old when she learned to knit, and if her father hadn't taken a year sabbatical in Switzerland, she may never have learned. During that year, Ann attended elementary school near Zurich, Switzerland, where beginning with the first grade, the girls and boys were separated twice a week to learn gender-specific skills. The girls were taught needlecrafts and homemaking; the boys were taught woodworking and technical drafting. When Ann joined the Swiss school, her classmates (accomplished knitters since the third grade) were working on custom-fitting textured knee socks. Ann's first project was a pair of baby booties that would have fit a twelve-year-old. A few months later, Ann knitted herself her first sweater. After returning to the states, Ann continued to knit, though none of her friends joined her. She knitted on and off through college while working on bachelor's, then master's degrees in geology. Before taking a "real" job in geology, Ann worked in a yarn shop, where she also learned to weave. Ann worked for a geological consulting company for several years, then decided to return to her love of fiber. 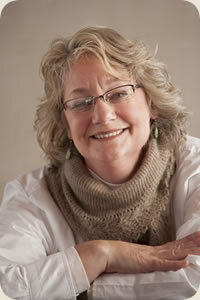 In 1989 Ann joined Interweave Press as an editorial assistant for Handwoven magazine. Through the next 18 years, she worked on Interweave Knits and as a book editor, and published her first book--The Knitter's Handy Book of Patterns--in 2002. Since then, Ann has authored more than a dozen books. Ann is now a freelance editor, author, designer, and instructor. In addition to teaching at guilds, retreats, and yarn shops across the country, she has taught at Sock Summit and Interweave Knitting Lab. In addition to these books, many, many articles and projects have been published in Interweave Knits, Knitscene, Piecework, and SpinOff, and SpinOff magazines. Designs have been published by Louet North America, Classic Elite Yarns, Brooklyn Tweed. Included in The Knitter's Life List by Gwen Steege. 1978: BA, University of Colorado at Boulder; major in geological sciences. 1982: MS, University of Washington at Seattle; geological sciences.